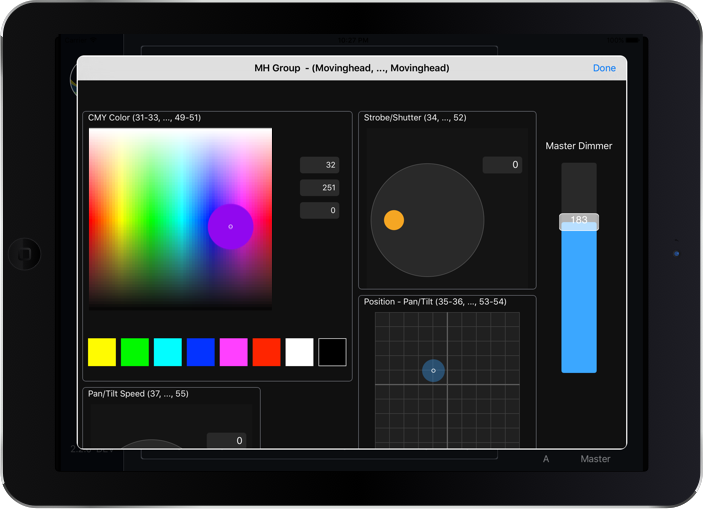 StageLight is a professional lighting control app for the iPad based on Art-Net (DMX512 over IP) and gives lighting designers and operators, musicians and artists, film and video makers advanced control of lights based on the Art-Net protocol (DMX512 over IP). The software combines the classic hardware lighting console feeling with a modern and intuitive design. Do you want to control a large number of fixtures? Create one or more groups, assign the desired fixtures and use the new Fixture Controls with multi-touch gestures for simultaneous control over them all. The StageLight app works fixture based. You can directly control 48 fixtures (72 on the iPad with 12,9" display). With groups you can control all fixtures of all DMX universes. Use the new Fixture Controls and multi-touch gestures for simultaneous processing of all attributes. Easily create and manage several lighting scenes and switch or fade between them. You can also insert and show play script information. Manage and control fixtures, groups and scenes in up to 10 DMX universes. Export and import your fixture libraries, groups and scenes. Use Dropbox, Evernote or your prefered application to store your ideas or share it with your friends or colleagues. Fixture Templates helps you to create your lighting setup faster. With favorites you can use your preferred fixtures as templates. Use Cues and Sequences to create awesome lighting effects. You can adjust fade-in, fade-out and the color (RGB and CMY) for each cue and fixture. Sequences are triggered by BPM or by audio peak. Use Moods FX for easy sound to light effects. Different Moods are available. Easy to use. Select lighting fixtures and tap the play button. Use StageLight CITP to control with a supporting visualizer (e.g. Capture) a fixture or a set of fixtures. StageLight can receive this protocol messages* and store this values as a scene. Control your lights e.g. with Ableton Live and StageLight over MIDI or plug your MIDI Pad Controller and turn StageLight into a hardware lighting console.